Albuquerque, NM. The Loan Fund, a nonprofit alternative lender statewide to small businesses and other nonprofits, has reached a significant lending milestone. According to its President & CEO, Leroy Pacheco, TLF has topped $50 million in cumulative lending since its founding in 1989, which has helped to create or preserve over 7,000 jobs. Loans to an Albuquerque-based insurance broker and northern New Mexico’s only year-round shelter in Santa Fe helped The Loan Fund exceed the $50 million mark. Pacheco also reported that between January and July of this year, The Loan Fund made 44 new loans totaling $1.8 million, creating or preserving 230 jobs. 30 loans went to minority-owned businesses, and 18 were awarded to women-owned enterprises. People interested in finding out more about The Loan Fund’s lending initiatives may call Pacheco at 243-3196, x 25. The Loan Fund was founded in 1989 by the New Mexico Conference of Churches with a mission to help alleviate poverty. 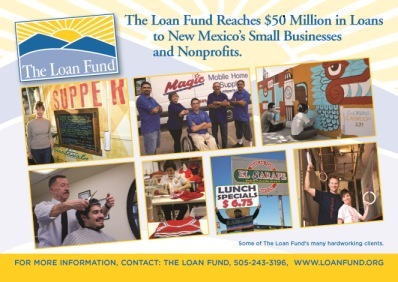 The Loan Fund is New Mexico’s largest and most experienced nonprofit alternative lender, providing loans and technical assistance to small businesses, microenterprises, and nonprofit organizations that are typically unable to obtain financing through traditional lending sources. The Loan Fund’s loans range from $5,000 to $500,000. Since inception, and the loan repayment rate from borrowers is 97.5%.